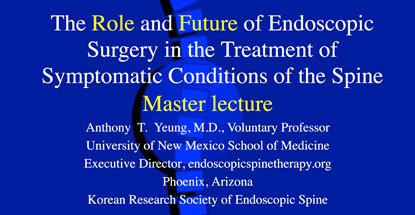 In his latest Master Talk, presented to the Korean Research Society of Endoscopic Spine, Dr. Anthony Yeung features not just the role, but what he feel is the future, of Endoscopic Spine Surgery in light of new Evidence Based Medicine Validation with Endoscopic Visualization of the Pain Generators augmented by patient feedback during surgery under local anesthesia, making it not just effective, but the most safe surgical procedure. Although there are various methods to treat back pain, endoscopic spine surgery is the least invasive procedure to treat the patho-anatomy of low back pain and sciatica and is supported by the findings that low back pain most often occurs due to discogenic pain. 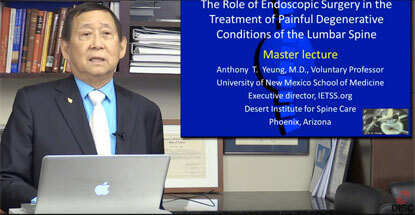 Endoscopic spine surgery is the most efficient and cost effective solution by practicing what is known as Evidence-based Medicine (EBM) which integrates clinical expertise, patients’ needs and values, and the best research evidence. 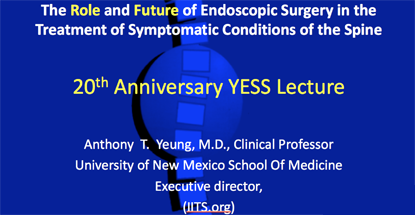 Dr. Anthony Yeung has given this Master Talk at multiple International Spine Meetings throughout 2017 in order to educate and advocate about the advantages of minimally invasive endoscopic spine surgery. IITTSS, a supporter of WCMISST, has been invited to put on a plenary session of 90 minutes on Endoscopic Surgery at the World Congress on Minimally Invasive Spine Surgery and Techniques Association (WCMISST) and Korean Minimally Invasive Spine Surgery Research Society (KOMISS) meeting on Jeju Island, Korea, June 1-4, 2016 that will be separate from the main scientific program of free papers and international invited speakers. Mr. Walter Eisner, Senior Reporter for Orthopedics This Week, plans to talk about what has been written by about spine over the last year. He is currently working on a feature about the last two hundred years of surgery and will quote Atul Gawande, M.D., M.P.H. (in his opinion, the best medical writer in America). Dr. Gawande wrote this for the current 200th Anniversary Issue of The New England Journal of Medicine. It totally speaks to what we are pioneering.